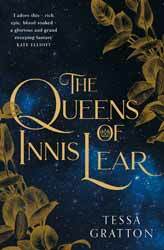 The Queens of Innis Lear is the first adult fantasy book by Tessa Gratton. I normally ask myself a couple of questions when reading a book. Are the characters real enough to gain my empathy? Do they go through a transformation during the story? Is the world building good and is the book well written? This is the first book which made me ask, what is the point of this book? Lear is based on the story of King Lear, who portioned up his kingdom to the ruination of himself and his family, made famous by William Shakespeare. Not that he originated the tragedy but based it on a much older tale. Lear’s original story comes in many forms with different characters making it to the end of the story alive. It’s not unusual that a writer may feel fine about taking the bare bone of the tale and spinning off their own interpretation. However, this is not what has happened. Gratton has indeed taken the story of Lear as a starting point, but more than this Gratton has taken directly from Shakespeare’s work, even lifting whole sentences from the play unadulterated. Characters can be directly mapped from the play to characters in the book and the main turning events are transposed from the play to the story. Cordelia becomes Elia, Goneril to Gaela, Regan retains her own name as does Lear, but the rest get a quick make over. So, what changes a play length text into five hundred and sixty-eight pages of prose. Gratton adds in certain fantasy elements, including the use of magic and the ability to talk to animals, plants and trees. There are extended sequences which fill in the backgrounds of the characters, so, when Elia is taken in by a foreign king, we can continue to follow her story, rather than he just turning up with an army at the end of the play. Most of the book consists of these extensions to the original and tend to be the more interesting parts of the book, as, for the most part you’re just waiting to see characters go through the same motions as they did in the play. The sad thing is that the book is not badly written, and I could imagine that had she just set the book out as a historical drama which filled in the gaps in Shakespeare’s play, or gone back to the earliest versions of the tale to create her own take on the story, it may have been more interesting. I feel that while Gratton is a good prose writer I’m not so sure I see the value of basing your work so heavily on someone else’s. So, the book scores well for prose, but not so well for originality.